Which type of Ground Floor Extension is right for me? 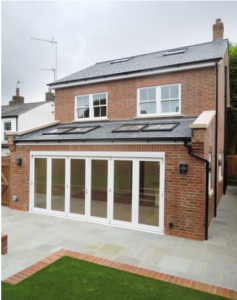 There are different types of ground floor extensions some of which are a side extension, a rear extension or a wraparound and each type has their own distinct features. If you want to save time, these house extension ideas do not require planning permissions as long as the new structure is under 3 meters length or 4 meters for a semi-detached house, single storey and not exceeding 50% of the land surrounding the original house. This type of ground floor house extension makes use of the extra strip of land at the side (like an alleyway) of the house and transforms it into extra valuable space for your home. This is especially useful for Victorian and Edwardian homes. The extra space can be converted into a larger kitchen or living area as the original exterior wall has been removed. Hence, the whole extension stretches across the full width of the house. Depending on the type of side extension you go for, it allows opportunity to brighten up the space with more natural light. It also allows for more experimentation in terms of the aesthetics. For instance you could match the extension with the existing brickwork, or allow for a more modern feel with glass panels and grey beams. A rear extension would extend out from the back of your home and open out to the garden. This would create more space to your home when your family is growing but don’t want to go through the hassle of moving houses – especially if you are living in London. This rear extension can be utilised to make a great open plan kitchen/dining area, have space for a utility room or an extra living room to entertain guests. The possibilities are endless with this extra space. 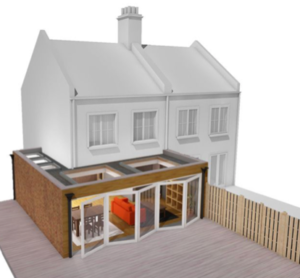 Some extensions will open into the garden, bringing the outside in for a fresh air dining experience. Others simply create a more flexible space for the whole family to enjoy. A wraparound house extension is a combination of both the side and rear extension hence would create an L-shaped space which wraps around your whole house. This type of home extension is perfect if your house has a back garden as well as an empty alleyway at the side of your home. 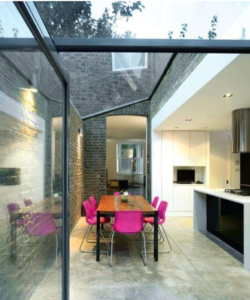 This type of extension allows for an even greater space for a kitchen/dining area or living room space. It also allows for more natural light to come into your home. Since this type of extension is one of the largest, it is important to think about the dynamic and flow throughout the rooms. This is type of extension can be seen as disruptive to the original building so there are many factors to think about when adding this space. if you are planning to do a two storey home extension then the process is very similar to the ground floor extension. Want to find out about the prices of doing a home extension? you can click here or alternatively, you can contact us directly.